The Grand River as the name suggests is Southern Ontario 's largest watershed. From it source near Wareham, Ontario in the Bruce Peninsula it flows south through Grand Valley, Fergus, Elora, Waterloo, Kitchener, Cambridge, Paris, Brantford, Caledonia, Cayuga and Dunnville. It ends its journey and empties into Lake Erie at Port Maitland. The drainage basin of the Grand River is very large and is fed by many tributaries, some of the larger creeks and rivers, include the Conestogo, Speed, Eramosa, Irvine and Nith river. Some of the more prominent features of the river are the falls and Gorge at Elora, the Luther Marsh, Lake Belwood and the Shand Dam. The Grand River has been designated as a Canadian Heritage River, both for its rich history and ecological importance. Fishing in the Grand River is very popular. Literally every species of fish that inhabits Southern Ontario can be caught in the river system. Walleye, small and largemouth bass, perch, crappie, pike, carp, brown trout, steelhead trout, channel catfish and white bass are just a few of the more abundant species present in the river. One of the most popular fish anglers target in the Grand River are brown trout. Fly fishermen search out these sometimes elusive fish by matching the hatch, carefully watching the insects present in the river and tying flies to mimic the forage. 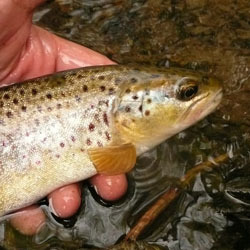 Fishing with surface flies can be exciting, although streamers and nymph fishing is most productive. Fly fishermen also target the abundant smallmouth bass that inhabit the river, with muddler minnows, surface flies and streamers being the most popular presentations. Hooking into a river smallie can be exhilarating, since they regularly become air born once hooked. 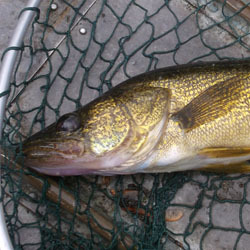 Sections of the lower river are heavily fished since many fish will migrate up river from Lake Erie. Steelhead trout, walleye, white bass, channel catfish and carp are all prized targets. Some of the largest fish in the river are the channel cats and carp which regularly exceed 20 lbs. Catfish anglers generally still fish with cut suckers as bait. The best time for Grand River cats is in early spring. Carp anglers also still fish along the banks of the river, usually baiting their hooks with homemade doe ball concoctions, worms or corn. The Grand River is a beautiful rural river in the heart of southern Ontario, with many access points. The Grand Valley Conservation Authority operates many family friendly parks with excellent facilities. Visit the Grand River for your next adventure and remember to bring your fishing rod, you never know what you'll catch. Each detailed map provides depth, contours, structure, boat ramps, and updated fishing information. 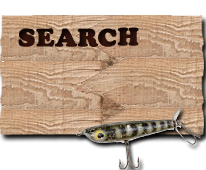 Grand River fishing maps also include lake info such as gamefish abundance, forage base, water clarity, weedline depth, bottom composition, complete latitude/longitude grid lines and dozens of GPS waypoints & coordinates.